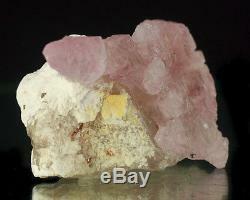 2.8 Gemmy Pale Pink ROSE QUARTZ Elestial Crystals on Matrix - Brazil for sale. What do we do to ensure color accuracy in our photos? Recommended stand : A suitable display stand comes free with this specimen. 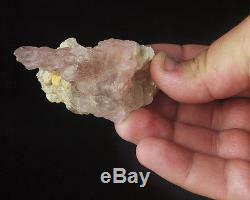 The rose quartz crystals on this specimen are a gorgeous baby pink. They are translucent and gemmy, with slightly vague terminations. The sides flash with an elestial jacare formation, which is very rare and I have never see before. This is a colorful, sculptural highly aesthetic specimen of quality rose quartz crystals. All of our specimens come with a custom label with accurate locality information. 2.8 small cabinet size. Sharp, terminated rose quartz crystals. 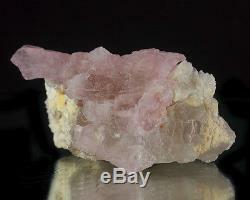 Extremely rare elestial rose quartz crystals. Locality Information about crystals/mineral specimens from this location. This gorgeous specimen of ROSE QUARTZ CRYSTALS comes from the Lavra da Ilha claim, Itinga, Minas Gerais, Brazil. Rose quartz crystals are rarely well crystallized, so when material from this deposit first came to light, people were astounded and delighted (and paid big bucks for even small specimens). We acquired this beautiful specimen from one of the Brazilian dealers who was set up at the Tucson Gem, Rock and Mineral Show. M ineralogy Facts about gems, rocks and minerals. Rose quartz is one of the most desirable varieties of quartz. The pink to rose red color completely unique, unlike any other pink mineral species. The color is caused by iron and titanium impurities. Rose quartz is used as an ornamental stone and as a gemstone. Although rose quartz is usually too cloudy to be used as a cut gemstone, a few exceptional pieces are found with enough clarity and color to make fine gems. 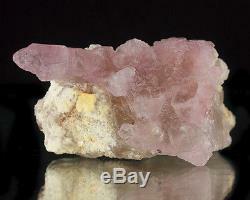 Most gemmy rose quartz is used as cabochons where the clarity is not as important as the color. Rose quartz is also a very attractive ornamental stone and is carved into popular spheres, pyramids, obelisks, figurines and ornate statues. Rose quartz is found in Madagascar, India, Germany and several localities in the USA. Much rose quartz was extracted from a famous site near Custer, South Dakota, but now, most of the worlds supply of good carvable rose quartz comes from Brazil. Brazil is also the only source of true well formed crystals of rose quartz. All rose quartz was believed to be only massive, found primarily in the cores of pegmatites. This lack of crystals is somewhat of a curiosity because quartz crystallizes into well formed crystals in all its other macroscopic varieties. So amazing are the rose quartz crystals that the first ones discovered were dismissed as fakes by mineralogists from around the world. Metaphysics Information about crystal, gem and mineral metaphysics and healing. People interested in metaphysics and crystal healing tell us that rose quartz emits a calming, cooling energy which can work on all of the chakras to gently remove negativity and reinstate the gentle forces of self-love. It provides the message that there is no haste in any situation, bringing calmness and clarity to the emotions and restoring the mind to clarity. Rose quartz is especially helpful for spiritual attunement to the energy of love. It provides for the balancing of the yin-yang energy, and can attune chakras to their proper energy vibration. Every specimen comes with our label, giving the full mineral name plus accurate locality information. Fine Mineral Specimens for sale Fine crystals for sale Metaphysical crystals for sale. We are an award-winning, internationally known internet mineral dealer with an impeccable reputation for high quality mineral specimens, fast, friendly service, and a 100% satisfaction guarantee on all sales. Our mission is to bring joy into the lives of our mineral collecting customers by helping them build high-quality collections of gemstones, crystals, minerals and rocks. To do this, we offer a wide variety of the finest crystals including loose gemstones for sale, large crystal clusters for sale, pyrite nuggets for sale, aquamarine gemstones for sale, and quartz crystals for sale. Also, you can read about us on Bob's Rock Shop, Mindat, and many other fine websites. 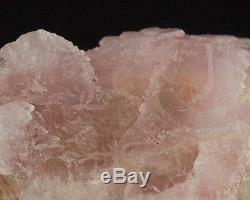 The item "2.8 Gemmy Pale Pink ROSE QUARTZ Elestial Crystals on Matrix Brazil for sale" is in sale since Tuesday, July 08, 2014. This item is in the category "Collectibles\Rocks, Fossils & Minerals\Crystals & Mineral Specimens\Display Specimens". The seller is "crystal-digger" and is located in Greenfield, Massachusetts. This item can be shipped worldwide.